Hello everybody! These are days of Milan fashion week..i would to be there!! Anyway i follow the fashion shows in streaming and i could see a lot of runways in the web.. I already set my sights on Gucci and Paola Frani's faboulous clothes.. OMG!! i want to share with you my favourite outfits!! Ciao a tutti! Sono giorni di settimana della moda a Milano..come vorrei essere anch'io lì!! In ogni caso ho seguito le sfilate in streaming e ho potuto vedere molte passerelle sul web..
Ho già puntato alcuni abiti ( irraggiungibili ) di Gucci e Paola Frani..OMG!! Voglio condividere con voi i miei preferiti!! ALBERTA FERRETTI : Colorful clothes, velvet boots.. very youthful look!! GUCCI: perfect. The colours are amazing..
GUCCI: I die for this beautiful evening dress..Vibrant colour..so perfect! GUCCI: How cute is this look?? And make up is so magnetic and sensual! MAX MARA: feminine and minimal little black dress..Perfect for cocktail party..
ERMANNO SCERVINO: I die for this fur coat..
ERMANNO SCERVINO: Cream coat.. perfect for a stroll in center! Perfect for job days! JOHN RICHMOND: a touch of gold sequins.. Get the glam for your nights out with this beautiful dress!! JOHN RICHMOND: glam and stunning dress! 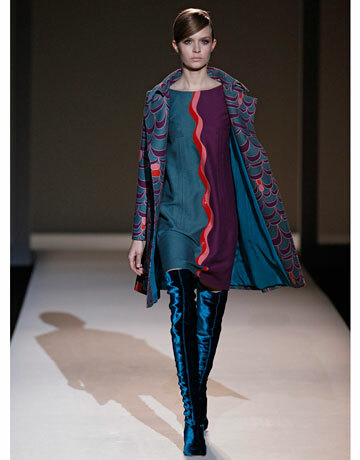 I love its texture..
FENDI: this dress can be considered an evergreen..orange tights are a news.. Unfortunately i don't like Fendi's whole collection..
PAOLA FRANI: I die for those pants..
PAOLA FRANI: Perfect look, i love this colour, punchy to face winter season.. Very elegante mise. PAOLA FRANI: I literally die for this elegant outfit..Beautiful printed dress and amazing pink suède shawl.Love it! !